Nacogdoches, Texas – Come hear the stories and see the sights of the oldest town in Texas each Saturday in October, excluding SFA’s homecoming weekend (October 25). Historic downtown walking tours start at 10:30 a.m. at the Visitor Center, located at 200 E. Main St. Tickets are $3 and can be purchased beginning at 10 a.m. the day of the tour. Children 12 and under are free. Historical landmarks on the tour include the last remaining Caddo Indian burial mound in Nacogdoches; Oak Grove Cemetery, home to four signers of the Texas Declaration of Independence; the Old University Building, which is the last remaining University building chartered by the republic of Texas; Zion Hill Baptist Church, which was built by Nacogdoches’ master architect Dietrich Rulfs; the Sterne-Hoya House Museum, which houses the first wine cellar in Texas; and much more. The walking tours take about an hour and a half to complete. JEFFERSON- The Sanctuary Players are bringing you side-splitting East Texas comedy again this spring! “Rex’s Exes” – Sequel to “The Red Velvet Cake War” – And, yes, it’s set in Texas, is set to take the stage in Jefferson this March! 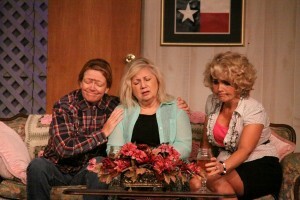 This deliriously funny Southern-fried farce finds the Verdeen cousins of Sweetgum, Texas—Gaynelle, Peaches and Jimmie Wyvette—teetering on the brink of disaster again. JEFFERSON- Set amidst the Spring glory of Jefferson’s “65th Annual Pilgrimage Tour of Homes & Spring Festival”, hundreds of Civil War re-enactors will answer an age-old question. Would Union troops have invaded the Port of Jefferson if they hadn’t been stopped short of Shreveport in 1864? 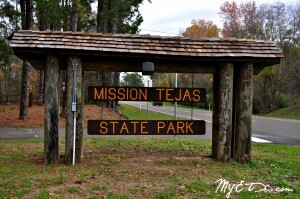 WECHES- Mission Tejas State Park will have outdoor fun on tap throughout the month of July! These events are informative and fun for the whole family. Get outside and enjoy beautiful East Texas!